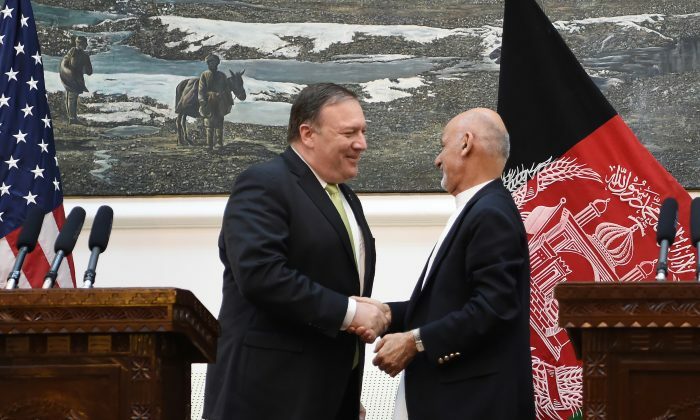 Afghanistan President Ashraf Ghani thanked President Donald Trump for his strategy in Afghanistan, which he described as “a game-changer” during a meeting with Secretary of State Mike Pompeo in Kabul, Afghanistan, on July 9. “Please thank President Trump and the members of the U.S. national security team for their trust in the future of Afghanistan and for bringing a strategy that has been a game-changer,” Ghani said, according to a transcript. In addition to passing along his thanks to Trump and to the U.S. national security team, Ghani also thanked U.S. troops who fought for 17 years to free his country from Taliban rule. He added that while the ceasefire in Afghanistan was experimental, it has been effective. That the Afghan people “display a genuine sense of a nation that is tired of war, that is willing to look to the future rather than the past, that can take all the casualties of the week before the ceasefire and have the compassion and the commitment to reconcile, has been truly moving,” Ghani said.